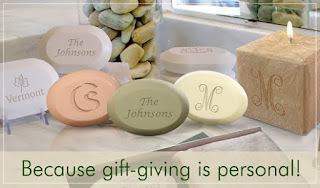 Personal Lea: From engraved soap to sterling silver jewelry! From engraved soap to sterling silver jewelry! We are always looking for unique things for our customers to order as gifts - or for themselves! In addition to the great engraved silver jewelry we are now offereing cufflinks, money clips and engraved acrylic housewares! Everything is the highest quality as usual and you will be proud to wear it yourself - or give it as a gift. Stop in to see all of the exciting new engraved things! What do you get for the person who has everything? Monogrammed soap of course! Featured on Opraph's O-List, tis is the most exquisitely carved fresh soaps in a variety of scents, styles and boxed sets - and this is a luxury gift that everyone can afford! You can get a name, monogram, initial EVEN a logo! We can also do collegiate and Greek soaps! The possibilities are endless and we know you'll be impressed. This is a family-owned, made in the USA product and we can't wait for you to experience it! We are planning on opening Saturdays to accomodate those customers who can't make it in during the week, so watch for the change in our business hours. Thank you, to all of our loyal customers. We will be starting our customer loyalty program in the coming month which will allow customers to accrue preppy points resulting in cash discounts! Everyone has been so supportive and we are excited with how well the new shop has been received. A special thank you to our great customers for being so patient as we have had to figure out how everything works and where everything goes! It's a work in progress but we're having fun! Right?! Watch the blog and Facebook for the next 'event' and coupons!! !